Veteran ‘buddies’ take Honor Flight to D.C. The fall Honor Flight group, which included Mr. Malandro and Michael DiFabio. 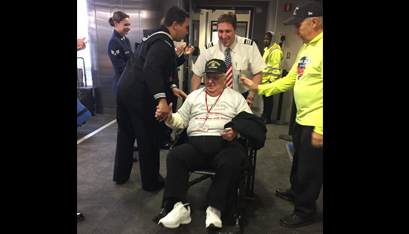 JOE MALANDRO ARRIVES at the Baltimore Airport for his Honor Flight. Every morning, Joe Malandro, Joe Naccarato and Michael DiFabio meet for daily Mass at either Our Lady of Assumption or St. Ambrose parish in Latham, and then gather for breakfast at nearby DinerTime restaurant. The three veterans — two served in the Korean War, one in World War II — have been meeting each day for years. They talk about their children and grandkids, and their time in the service. 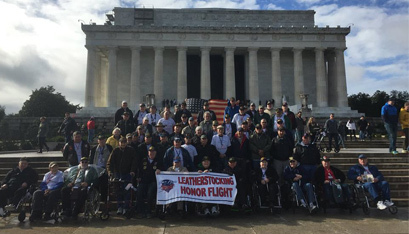 On Oct. 27, Mr. Malandro and Mr. DiFabio met for a different purpose: a trip to Washington, D.C., with the Capital Region’s Leatherstocking Honor Flight organization, something Mr. Naccarato had done a few months ago. Honor Flight is a non-profit providing free trips for American veterans to visit veterans’ memorials in Washington. There are two Honor Flights each year, one in the spring and one in the fall. Each veteran is assigned a guardian for the day and is provided with a wheelchair, means and any other necessary accommodations. “It’s our way of saying, ‘Thank you for your service,’” said Rhonda Cooper, Honor Flight’s local veteran coordinator. Mrs. Cooper, who came to Honor Flight as a volunteer almost six years ago, now organizes trips for hundreds of local vets every year. The most recent trip included 58 veterans, six of whom served in WWII. Mr. DiFabio was one of those; he served in the U.S. Air Force. Mr. Malandro served in the Army during the Korean War. Mr. Naccarato is also a Korean War veteran who served in the U.S. Air Force as a crew chief. He was unable to make the recent trip, having already taken the spring Honor Flight with friends from his hometown of Kingston. After a wonderful experience, Mr. Naccarato told Mr. Malandro and Mr. DiFabio about the Honor Flight, and encouraged them to go. Mr. Malandro said that “we were side by side” for the whole trip. The journey was even more special because it fell on Mr. DiFabio’s birthday. The group sang to him and surprised him with a cupcake with candles at dinner. The Honor Flight trip began with a sendoff at Albany International Airport. Congressman Paul Tonko thanked the veterans for their service; dozens of family members and friends made signs of support. After landing in Baltimore, the group was greeted again as they exited the plane. People clapped and cheered for the veterans as they made their way to their tour buses, and they were escorted by police to the various memorial sites. Stops included the Vietnam Memorial, the Lincoln Memorial, the World War II Memorial and the Korean War Memorial. At the Vietnam Memorial, the veterans made rubbings of the names of friends or loved ones listed on the “long black wall” to take home. Both Mr. Naccarato and Mr. Malandro joined the military right after high school. He recalled that he got in trouble on his first day of training for going to bed early. His sergeant put him and his friend, Rocco, on the grill in the cafeteria, and afterward had them wait in the meat locker for a meat delivery to arrive. To this day, Mr. Malandro admits to being the “troublemaker” of the group. Mr. Naccarato served four years in the Air Force, mainly from his home base in Florida. He assisted with the upkeep and maintenance of planes, some of which included B-47 bombers. It wasn’t until years later, after all three of the local Catholics had served their country, when the trio met. In the 1980s, Mr. Malandro ran an ice cream parlor and deli in Latham where Mr. DiFabio, who worked nearby as an attorney and CPA for his own law and accounting firms, would often grab lunch. The two became lifelong friends. In 2014, Mr. Naccarato met Mr. Malandro during one of his hardest times. Mr. Naccarato was at Most Holy Redeemer Cemetery in Niskayuna, visiting his wife’s grave, when he saw another man weeping. He went up to the man and comforted him, learning that his new friend had just buried his wife a few days before. Mr. Naccarato also says the rosary every day for his wife while sitting in her chair at home. Mr. Naccarato and Mr. Malandro try to visit their wives’ graves every morning, as well. Now, the friends can add talking about their Honor Flight trip to their conversation at their breakfast gatherings. After visiting the memorials, Mrs. Cooper surprised the veterans with “mail call:” Before each Honor Flight, the family and friends of every veteran are asked to write letters for their loved ones to open on the trip, much like when the soldiers received letters from home during their service. Local Girl Scout troops and school children from across the Albany Diocese also wrote letters for the veterans. Mrs. Cooper said she’s never had to ask nearby schools or scout troops for letters; they hear about it through word of mouth and eagerly participate. After the trip, as they landed back in Albany, the veterans were greeted once more by family and locals coming out to thank them for their service. All three Catholic vets will be talking about the trip for some time to come. “I just love both of them,” said Mr. Naccarato of his friends.